In case you missed the captivating story, Imgur user PhotoFromMyDeck and her husband have been tracking the health of their premature baby through an album of stunning photos. Their daughter was born three months ahead of schedule. 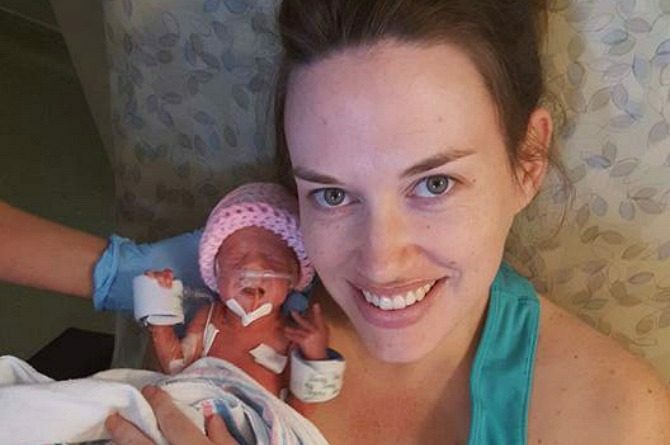 Apparently, their adorable baby girl was born premature due to an infection of the placenta. Take a look at the progress this precious baby girl has made over time. As you can see, her mom and dad had reason to be worried. However, they knew that their daughter would make it through! She was born a fighter! Here we see a mom and her tiny baby daughter embracing each other for the first time. This was only the beginning for this courageous family. Some time later, we see this mommy and her precious little girl together again. She’s looking healthier and bigger already. What remarkable progress! The journey’s not over yet! See the rest of this baby girl’s remarkable progress by clicking next! It’s been 100 days, and she looks amazing so far! Not only is baby looking happy and healthy, but so are Mom and Dad. Though their daughter was born to some pretty unfortunate circumstances, this family was determined to maintain a positive outlook and keep moving forward. As you can see, that determination resulted in some pretty fun-loving times for a dad and his teeny-tiny daughter! This family’s amazing album and story received over 23,000 views…in the first 24 hours after posting! There’s no telling how much attention the inspiring and touching album will gain over time. Either way, this family’s story is something to behold and they were awesome enough to share their long and challenging journey in the most stunning and adorable way possible!